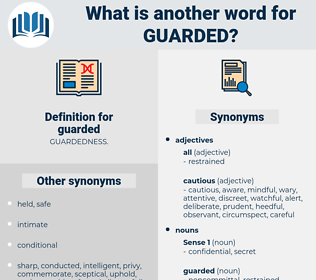 What is another word for guarded? safeguarded, guaranteed, protected, armoured, Defended, supervised, restrained, moderated, arranged, reserved, Policed, vigilance, preserved, measured, Accorded, scrutinised, protectable, unprotected, decommissioned, Watched, Upheld, Overseen, appropriated, controiled, designated, enforced, accompanied, saved, conserved, Detained, detached, conditioned, restricted, alright, Audited, observed, sheltered, draped, recovered, mediated, dedicated, attended, Insulated, checked, verified, shielded, Inspected, retained, contained, Surveyed, Exercised, hedged, bugged, unopened, trapped, Overlaid, trusted, Incubated, copyrighted, Operated, Reared, Ascribed, Overlain, capped, harmed, Carried, treated, allocated, enclosed, sealed, Screened, Cared, tempered, Remained, confined, held, coated, cultured, Earmarked, located, devoted, Borne, Sentenced, latched, covered, Performed, Exempted, withheld, fenced, masked, locked, left, shaded, shut, gone, put, allotted, kept, Stayed, controlled, Stowed, spotted, raised, booked, tested, vetted, stocked, burned, heard, limited, placed, lost, stored, closed, Gotten. Patrolled, secured, monitoring, monitored, maintained, Escorted, tracked, Housed. incautious, unsuspicious, uncareful, outgoing, unwatchful, unguarded, careless, extroverted. inattentive, impetuous, brash, reckless, heedless, unwary, absentminded, asleep, unsafe, forgetful, injudicious, rash, neglectful, indiscreet, regardless, inadvertent, unmindful, thoughtless, unplanned, venturesome, imprudent, inconsiderate, bold, remiss, unintentional, lax, negligent. When the vast extent of our country is considered, it is plain that every obstacle to the free circulation of commerce between the States ought to be sternly guarded against by appropriate legislation within the limits of the Constitution. She believed that such forms of play were peculiar to themselves, so she guarded them as the deepest kind of secret; for she thought, if her mother ever found out about them, she would at once conclude that the whole relation was childish.